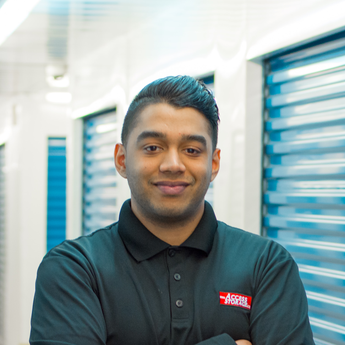 If you’re using your storage unit long term, it can be very easy to pack up your belongings and walk away from the unit until you need it again. However, it’s important to clean and maintain your unit for the sake of your belongings. Keeping your unit clean helps to ensure you find your belongings in the same condition in which you left them. If it’s been awhile since you’ve seen your unit, it may be time for you to revisit your belongings. Follow these steps to a clean and well-kept storage unit. Give yourself a deadline to have your unit cleaned by. It is possible it may take more than one visit to get everything in order. You may find valuables you forgot you had and it is okay to give yourself the time to really go through these items and see if there is anything you want to take out of storage. Come ready with help. Ask you friend or family member to help you tackle the unit, two heads- and two sets of hands- are better than one. Use the four-box declutter method to help you clean out your unit. Is there anything in your unit that can come out for the season? Anything that you don’t want to keep anymore? You may find something you’ve been looking for. Have boxes labelled “Keep”- these items are to come home with you, “Toss”- for items you no longer need, “Donate/Sell” and “Store”- for those items that will remain in storage. Start in one corner of your unit and work your way around in sections. Go through everything- this means opening every box, sorting through the items and seeing what you have. If you feel it necessary, you could consider hiring a professional organizer. Now the fun part. Empty your unit of your valuables to allow you to sweep and mop the entire unit. Dust and wipe down all your items before putting them back in their boxes. While you’re doing this, inspect the items for any damages. If you have shelving in your unit, dust and wipe those too. Use microfiber clothes to clean dust to trap the dust in the cloth instead of spreading it around in the air. Move your belongings around in the unit. You should still keep the larger items such as furniture in the back, but if you have rugs for example, try folding or rolling them in the opposite direction to avoid leaving permanent creases in it. Try to visit your unit periodically- set a time in advance if you have to. If you’re storing your items long-term, plan to visit at least once a season instead of leaving it all year long. If you haven’t already done so, consider storing more of your items in plastics boxes instead of cardboard. This will not only make cleaning easier in the future but it will also protect your belongings better. Plastic boxes work great for clothing and linen, however if you want to save even more space, you could consider using vacuum sealed bags. When you’re packing up your storage unit, organize it to give you access to your items. Put items you may need more often at the front of your unit while the larger items go to the back. Leave yourself some space between the boxes to allow for access to items in the back of the unit if necessary. This also helps with regular cleaning needs, so you don’t have to completely unpack the unit every time. Cleaning can be a hassle and it isn’t a choir that most people want to do. Following these steps to keep your storage unit clean and organized will make it easier and faster the next time around so you can have more time to do the things you enjoy.